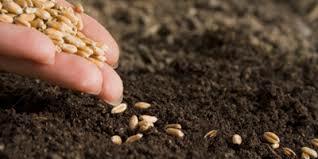 On Wings of Eagles: Your harvest depends on how much you sow. Verse 6 of 2 Corinthians 9 says: “He who sows sparingly will also reap sparingly, and he who sows bountifully will also reap bountifully.” Do you know anyone who wants to do a little bit of work, but take home a big paycheck? People like this want to be highly favored by God. They want a big blessing; they just don’t want to do anything for it. A farmer knows that if he wants 15 acres of produce, he’d better sow 15 acres of seed. He can’t just throw out a few leftover handfuls of seed after he has eaten all the grain God has provided, and then expect to reap a bountiful harvest. This is where it gets convicting. Too many people in God’s family want a big payday from heaven when they sow nothing, or very little, in terms of honoring God with the first and best of their resources. A farmer who sows sparingly isn’t fooling anyone but himself if he thinks he’s in for a bountiful harvest, and the same is true for any believer. That’s why the Bible says we can’t fool God. Are you holding back from giving because you’re afraid of what might happen? If so, remember that when we obey God and sow in faith for His glory and not for personal gain, we not only reap what we sow, but more than we sow. What area of your life are you holding back from giving, out of fear of the worldly consequences? Dear Lord, help us to sow to the fullest. Help us to not hold back as we spread Your love. In the Name of Jesus, Amen.